This is my last reminder about the Four Seasons Assignment for 2011. With the due date being the 28th of December, you can still get all four seasons in before then. Once the Sun reaches the Summer Solstice, I would say you would be too late to start. Springtime at Taughannock Falls State Park near Ithaca, New York. Nikon D700/Tokina 11-16mm, 1/8s, f/22, ISO 200, EV -1.6, 16mm focal length, tripod. Spent a lovely Spring morning at Taughannock Falls State Park last Saturday. Much different than the last time I visited back in January. The mist and wind direction around the falls did not allow for photography at the end of the gorge trail observation deck this time. Instead, I set up the tripod next to the pedestrian bridge over the creek and used the Tokina 11-16mm f/2.8 AT-X116 Pro DX Wide Angle Zoom at 16mm on my Nikon D700 digital SLR camera. The stone wall and gorge ridges making nice leading lines right to the falls. Notice the shaded and sunny areas in this photo. The south side (left) gets little sunshine anytime of the year thus you find plants and trees like hemlock and trillium which are not found on the north side (right). 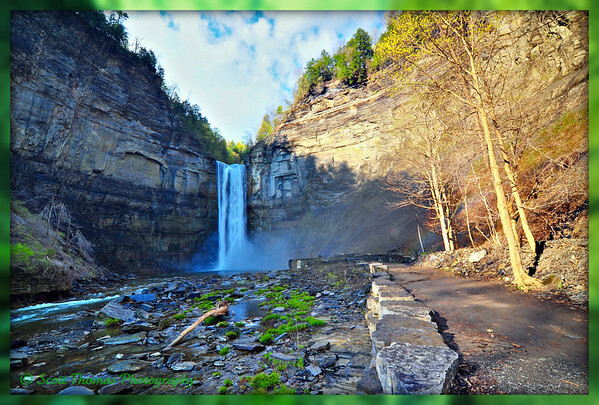 This entry was posted in Assignments and tagged creek, new york, nikon D700, rocks, saratoga springs, spring, state park, stones, taughannock falls, tokina 11-16mm, trail, trees, water, waterfall. Bookmark the permalink. Thanks for the reminder, Scott! I would have forgotten! You’re welcome. Always like to be of service. Thanks, Michaela! Such a contrast from my last visit. I sure hope this is saying something nice. You’re welcome, Isa. Looking forward to your submission at year’s end. Thanks and congrats on getting Freshly Pressed this week! I’m definitely in at the Four Seasons Assignment … This is a wonderful place, and it must have been lovely to spend this Spring morning here!